The urgency to get direct carrier billing deployed and active, to avoid long term loss of access to high spending users has been brought into sharp focus over the last few weeks by the big surge in revenues coming in to app stores from the arrival of Pokémon Go. Where carrier billing is deployed, the Pokémon Go users that decide to buy lures, more balls or incense can just click a button and pay. Many of these users will be first time buyers. They won’t have the time or inclination to get out a credit card – even if they have one. Where carrier billing is not yet available, there will be an option to use credit cards or gift cards. Previous studies have shown that when content is compelling – and Pokémon Go certainly seems to be in that category, the number of users entering credit cards in developed markets soars from 8% up to as many as 25%. Potentially a quarter of users at that point – who would almost certainly have been initiated to carrier billing – are lost for months if not years – and along with them all the downstream revenue. With Pokémon Go it could be that children at that point get hold of their parents credit card details or buy prepaid credit cards to feed their habit. The permanent loss of carrier billing could be worse. 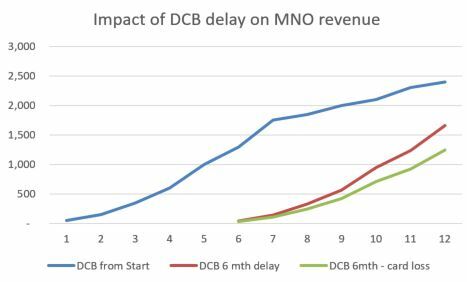 Using the standard Harris-Goldberg model, assuming 25% permanent attrition, the impact of a delay in DCB will be substantial and permanent. The message: If you are deploying DCB, deploy it quickly before users get into the habit of using workarounds. This entry was posted in Android, app store, carrier billing, Mobile apps, mobile payment, mobile web, operator billing. Bookmark the permalink.